The timely and secure delivery of packages through face-to-face services has long been a source of pride for Japanese couriers. But times have changed. With more women and seniors working and single-person households increasing, face-to-face deliveries to the home are proving more difficult. The rise of online shopping and the labor shortage have also made it harder for delivery services to handle everything through home deliveries. For these reasons, the logistics industry is trying out a system of drop-off lockers, believing their use could widen pickup options for consumers as well as achieve more efficient parcel handling for the couriers themselves. In today’s ‘FYI’ we look at these new drop-off locker systems in more detail. What is a drop-off locker and how is it used? A drop-off locker is a physical locker used to store items people have purchased online until they are ready to collect the items. Consumers who buy goods from an internet store can ask a courier to put the item in a designated locker. Once it has been dropped off, customers receive a notification via email and can go and pick up the item. 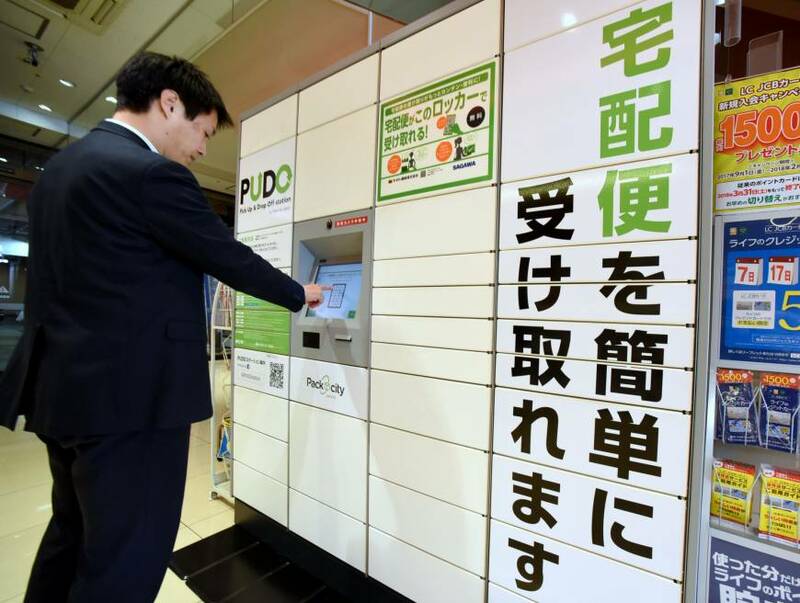 Packcity Japan Co., a Tokyo-based drop-off locker operator, started installing PUDO (pick up and drop off) stations in 2016, mainly in Tokyo and the surrounding prefectures. The firm — which is jointly funded by Japan’s top courier, Yamato Transport Co., and France-based Neopost — had set up about 2,000 lockers as of early this month. The lockers can be used not only by Yamato but also its rivals, including Sagawa Express Co.
To use the lockers, customers need (in principle) to become registered members of each courier’s online service. Japan Post Co. has also been running a locker service called Hakoposu since April 2015. This service currently only accepts parcels delivered by Japan Post but the firm is considering partnering with others, a Japan Post representative said. The service currently operates 192 lockers in major cities. Where can we find the lockers and what kind of parcels can they hold? 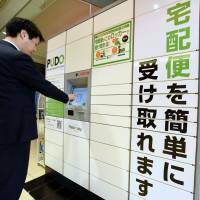 Packcity Japan said it mainly installs lockers at train stations, supermarkets and drugstores — places people are likely to frequent in the course of their daily lives. They can pick up packages while commuting or grocery shopping, said Yoichiro Katsu, a Packcity Japan executive overseeing its sales and marketing group. “Supermarkets and drugstores are very cooperative, since they can expect people to shop when they come to get their parcels,” said Katsu. He said Packcity Japan bears the entire cost of installing the lockers and charges parcel delivery providers a fee to use them. The lockers can hold packages for which the sum of their width, height and length is 100 centimeters or less, and their weight is 10 kilograms or less. The operator does not accept parcels containing food. Why is the use of such lockers increasing? Other than the home, parcels in Japan can be picked up at convenience stores and at delivery firms’ branches — both still face-to-face services. Katsu said Yamato learned about NeoPost’s drop-off locker service in France while it was researching potential alternatives for customers. “We thought people might want to receive parcels without having to face anyone,” said Katsu. A Yamato representative said the nonface-to-face service would be helpful for women living alone, for instance, because some may feel uneasy about opening their door to a stranger. The anonymous option may be quite a big change for the country’s logistics industry, since couriers have long valued the importance of face-to-face service. The major providers are competing hard to improve quality, such as handling parcels safely, offering delivery time schedules convenient for users and arriving on time, said Katsu. “In the past, mail orders were used mainly to send gifts, so it was important that those gifts were delivered to homes safely by mailmen,” Katsu said. But thanks to the internet many people now use online shopping services to get even a small item, contributing to a surge in parcels. In fiscal 2016, the number of parcel deliveries were about 4 billion in Japan — an increase of more than a billion from fiscal 2006. What are the other merits of drop-off lockers? Katsu said one of the main reasons for introducing drop-off lockers was to mitigate the labor shortage, which hit Japan’s logistics industry hard last year. Yamato Transport raised its basic shipping rates for individuals by 15 percent on average amid a driver shortage. Japan Post is planning to raise parcel delivery rates by 12 percent starting in March. The increase in working women and working seniors, and single-person households, has also led to more households where no one is home to receive packages during the day. This has resulted in a surge in cases in which delivery services have to repeatedly visit homes to deliver packages when someone is in, resulting in a logistics burden. Katsu said, however, that the lockers have yet to yield a visible impact. Since many people are still not aware of the drop-off lockers, the firm still has to increase their numbers and encourage their use to make them a part of the delivery infrastructure, he said. “Then we’ll start seeing an effect, which I think will still take a while,” said Katsu. Yamato Transport Co., Japan Post Co., drop-off lockers, delivery firms, Packcity Japan Co.